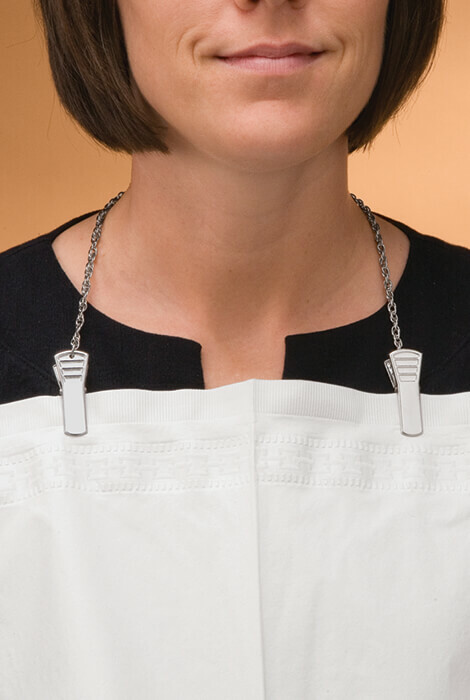 Napkin clip attaches to any napkin so that you can enjoy spill-proof coverage without fuss. Great for any size cloth or paper napkin ... keeps eyeglasses handy, too! Nylon, metal. 21 1/2" long. IT SURE BEATS TRYING TO TUCK A NAPKIN IN THE TOP OF YOUR OUTFIT. My husband has MS and frequently spills his food while eating. This will hopefully save some shirts from stains. Why hasn't this been here earlier? What a great idea. I was always trying to tuck napkins in my clothes when I was eating. I had this idea myself years ago and was delighted to find that someone figured out how to do it. I am ordering 4 more of these for my husband and to use on our boat. They work great and have saved many shirts/sweaters/dresses! Yeah! Keeps paper napkin in place! I have 4 messy boys (ages 6-13)and I was getting tired of the food stains on their shirts. We started requiring them to tuck a paper napkin in their shirt collars during meals but the paper napkins would not always stay tucked in. I saw these clips and they are just like the ones you wear at the dentist. I bought a set for each of my boys and a few extra for spares. We even take them to restaurants and they fit in my pocket. Jason T.
Buy one for home and one for travel. With my limited mobility and neuropathy, this product is still easy to use. I'd order another one to keep in my purse. So much nicer and more refined than sticking a napkin in my shirt top. I carry this item everywhere. Everyone who sees it wants one. Now I won't ruin anymore clothes. I acquired the Napkin Pin Holder in order to keep my clothes from being soiled at the meal table. Several of the members of the retirement home liked it also. Thus i have ordered more Napkin Pin Holder's that I have given to my fellow residence. I bought some actual bibs a while back, but they were uncomfortable and are wearing out. Now, hand towels, wash clothes, dish towels or whatever can be bibs! I do wish the chain was just a little shorter, or better yet--adjustable. To clip my napkin around my neck when eating in my chair. This helps to keep spills off my clothes. I have been looking for something to use to protect my tops and blouses from food and this works great!! I keep it in my purse and I love how easy it is to use. I eat alone in front of the TV most nights and it's not the neatest way to eat. This is better than trying to tuck a napkin in your shirt.